Every so often, Cameron will randomly pipe up with something he wants me to bake him. Something I usually forget about 20 minutes later. So I got him to join Pinterest, set up a board and asked him to pin things he wanted me to make. And then, like a devoted girlfriend, I forget to refer to it ever. So when I’m excitedly chattering away about the next dessert idea I’m conjuring up in my head, he’ll subtly nudge me about the thing he really wants. 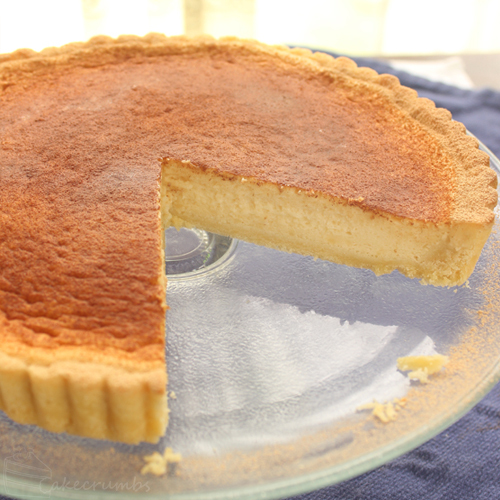 The last few times the dessert of choice has been a milk tart. Last weekend we were both off doing different things and I got home before he did, so while I had some time to myself I thought I’d surprise him by finally knocking this pastry off of his wishlist. 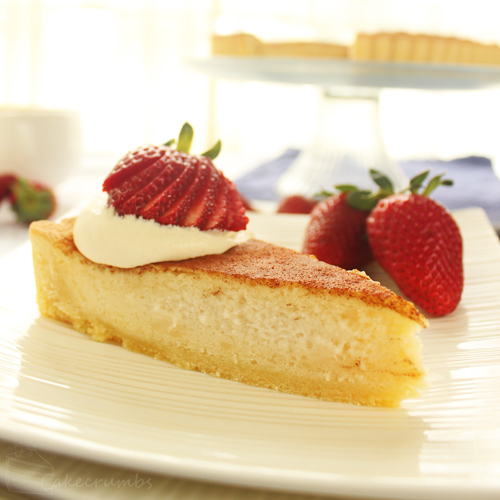 Milk tart, or melktert in Afrikaans, is a dessert that hails from South Africa. He first tried when a South African colleague of his bought one to work for the Big Cake Bake, a charity event they were hosting at work. Ever since, he’s intermittently nudged me about making one. Part of the reason for my being so slow in fulfilling this wish was how bland it sounded. I don’t know about you guys, but any treat with milk in the name that isn’t a milkshake doesn’t really inspire my appetite. Dilute and bland were the first words that struck my mind upon the mention of it, so I procrastibaked and found something else to try. I was more than happy to discover how wrong I was. As I started poking around the web to find out why he liked this dessert so much and what it involved, the answer became quickly apparent: cinnamon and custard. Only two of his favourite things. I have to admit to be quite partial to cinnamon myself. As I infused the milk with cinnamon and set about making the custard the smells that filled the kitchen were a little intoxicating. Cameron arrived home just as the tart was midway through baking and immediately followed his nose to the kitchen to see what was going on. I made him guess and he mentioned some half a dozen desserts before he finally hit upon milk tart: the rest of the night mostly involved him asking me when he was allowed to eat some. 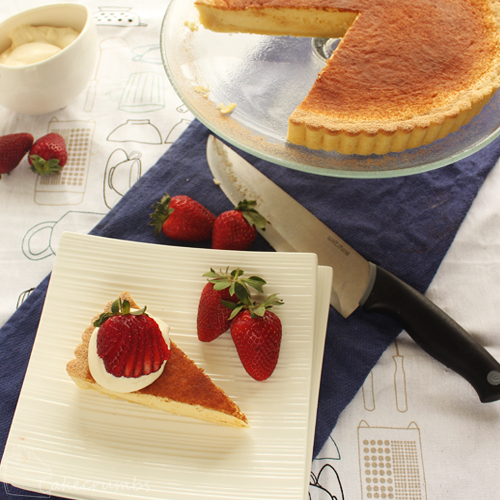 Much like a regular custard tart, there were a plethora of ways to make it. Different pastries, different cooking methods… some methods didn’t involve cooking at all. I picked out my favourite parts of a few different recipes and set about making it. For the base I stuck with a basic shortcrust pastry. 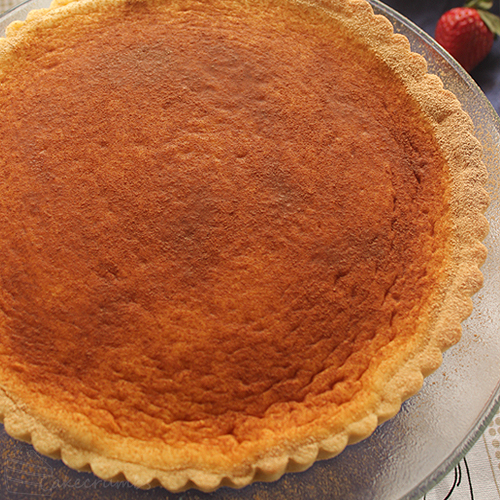 If you need tips on making the perfect shortcrust, check out my rambles on this one. For the centre I went with a baked version. After it baked it emerged from the oven with a puffed and swollen belly, but as it cools it sinks down to create a perfect surface. Then you dust the entire thing with cinnamon and icing sugar. One of the first things he asked me the next morning was whether he could have a slice. I told him I had to take photos first so he hovered over my shoulder the whole time. As I sliced into the tart he muttered, “Mmm, look at that cut.” When I asked him what he was talking about he replied, “Just look at the way it springs and bounces back and cuts so smoothly. Like a pillow.” In that moment I thought he might give up waiting and just shove his face into the whole thing right then and there: his patience was definitely hanging by a thread. It’s the greatest thing when you cook for people you love and the result is so eagerly received. When I finally settled down to trying it myself I understood the love for the dessert. It’s everything you could want in a custard tart, but the lightness created by the meringue in the filling gives it a refreshing quality that’s missing from its cousins. Cameron said it reminded him a lot of a baked cheesecake, his favourite cake, but lacked the heaviness of the cheesecake that makes you feel bloated and full afterwards. This was all to easy to squeeze in a second slice. I served it up with some whipped cream I added some of the spare cinnamon sugar to and fresh strawberries. A lot of places recommended serving it with ice cream as well. But it’s the type of dessert that does just as well all on its own. It disappeared incredibly quickly, helped along by how easy it is to squeeze in. Here’s how you’ll make your very own. Form dough into a flat disc, wrap with plastic wrap and chill in the fridge for 20 minutes. Meanwhile, grease a 24cm tart pan. Gently roll the dough out until 5mm thick, taking care not to overwork the dough. Ease the dough into the tart pan. Trim away excess pastry, then refrigerate for a further 20 minutes. Preheat oven to 180°C (160°C fan-forced/355°F). Line pastry with baking paper and fill with pie weights or raw rice. Bake for 15 minutes; remove paper and weights and bake for a further 12 minutes. Allow to cool completely. 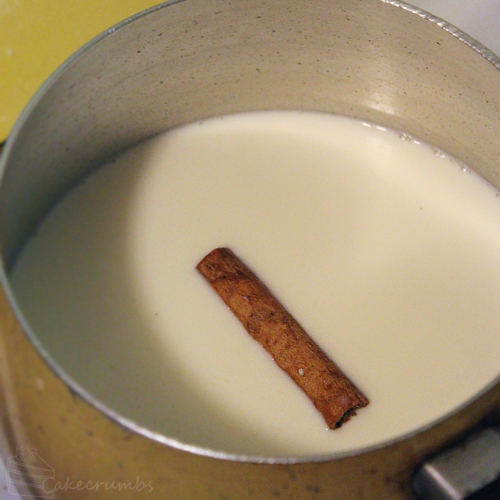 In a heavy based saucepan, heat the milk with the cinnamon stick until mixture boils; remove from heat and allow to stand for at least 10 minutes to infuse. Place the egg yolks, flours, sugar and baking powder into a bowl and whisk to combine; whisk in the milk and little at a time to temper the eggs. Strain the mixture back into the saucepan to remove the cinnamon stick and any other lumps. Cook mixture over low heat, stirring continuously, until mixture thickens (about 5 minutes). Remove from heat; beat in butter until combined. Cover and set aside until mixture cools to room temperature. Beat eggwhites in a clean, grease-free bowl until it reaches soft peak stage. Gently fold into custard mixture, the pour into the pastry casing. bake for 25 minutes, or until the top is puffed, slightly golden and the centre has only a slight wobble when the dish is shaken. Allow to cool to room temperature. 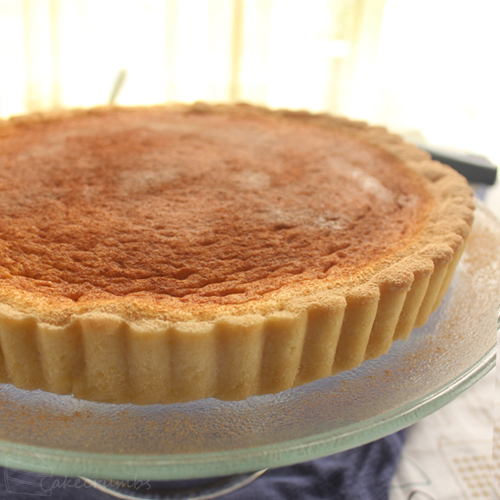 Soon before serving, combine the cinnamon and icing sugar and dust over the top of the tart. Serve with cream and berries. I LOVE your plates! Where did you get them? I think I bought them from some local homeware store, but the’re Maxwell & Williams brand. I believe it’s from their White Basics (Cirque) range. I made this – and found success! It was quite eggy, I think I will add one less egg next time – though I probably didn’t get the egg whites quite fluffy enough. I love desserts with cinnamon, and this is a real treat that I recommend! I’ll be writing a blog post on this and recommending the recipe, thank you for sharing it! My pleasure! I’m glad it worked for you! Your website is amazing!! A friend sent me a link to the structural planet cakes today and I’ve not been rooting around ever since. Finding this childhood favourite is even better, I’m now finally going to have a crack at baking it. I’d really like to try this recipe, but my boyfriend and I are both lactose intolerant. Do you think that I could substitute the milk for almond, soy, or rice milk? I’ve used those as substitutes in coming before, but not baking. It’s worth a shot! I’ve subbed almond milk in baking a few times and it seems to have worked well enough. I can’t guarantee that it will work perfectly with this dessert of course as I haven’t tried, but it’s definitely worth a try. I’d love to hear back from you if you do, solely to help anyone else needing an animal-dairy free version. That’s awesome! Thanks for the follow up. Hello, I love reading your blog but this is the first recipe I’ve tried from it and it worked perfectly. My husband requested this for his birthday and was stoked with the result :). Thank you! I’m glad it worked out so well for you! Wow, im in love with your blog. your baking is absolutely BEAUTIFUL. Hi! I also found your site through a link to the structural planet cakes, and I have been drooling over your baking ever since! A couple of years ago a women’s interest magazine in South Africa ran a national contest to find the best Melktert recipe around. Here is a link to the winning recipe, if you are interested to try it. Thank you for that, I’ll definitely give it a go! It’s my first time to make melktert and it turned out so good! I served it with mashed cherries and it was really delicious. I have to say that cake was better than the one I tasted in a cafeteria in South-Africa 🙂 Your blog is amazing, I certainly will try some other recipes too. Thank you from Tallinn, Estonia! Oh that’s wonderful! Mashes cherries sounds like a perfect accompaniment. I made this tonight for a potluck for my class that is traveling to ZA for a research trip. I had to make the filling twice because the first time I tried to whisk the egg yolks into the flour mixture, I got a bunch of lumpy yellow globs in the filling and it didn’t thicken. I tossed it and tried whisking the yolks into the milk first, and then into the flour. That worked much better. I made a stencil of the ZA flag for the cinnamon on top. Can’t wait to serve it! Were the egg yolks all globby before adding the milk? Sometimes if the yolks are on the small side there’s not enough liquid to combine with the flour properly. 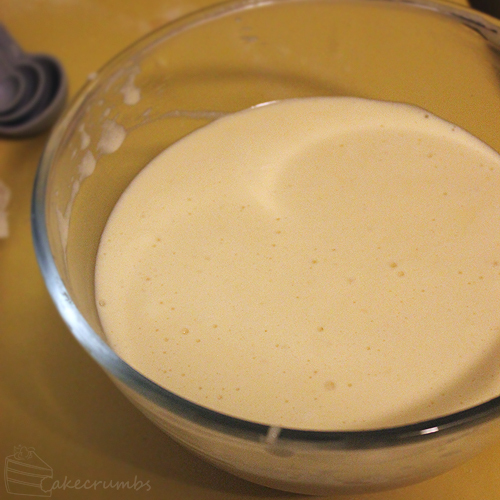 I usually add a tablespoon or so of the milk and keep whisking until it’s all smooth to solve that issue. I’m glad it worked out for you in the end!